At times prayer can seem like hard work or a bit of a mystery. At other times it's an encounter with the Living God. Wherever you are on the journey of faith, Life Source will encourage a discovery of new-found joy and delight in prayer. The course combines Bible study and discussion with a creative, hands-on exploration of five prayer patterns from our rich Christian heritage. Ideal for Lent, cell or house groups. - Publisher At times prayer can seem like hard work or a bit of a mystery. At other times it's an encounter with the Living God. Wherever you are on the journey of faith, Life Source will encourage a discovery of new-found joy and delight in prayer - for novices and old-hands alike. The course combines Bible study and discussion with a creative, hands-on exploration of five prayer patterns drawn from the richness of Christian heritage. In five interactive sessions, this course aims to help groups explore: Source of life - prayer as relationship; Source of joy - prayer as enjoying God; Source of light - prayer as listening; Source of wholeness - prayer as honesty; and Source of love - prayer as care. Each session contains enough material for a 90-minute session and includes: guidelines for group study, full background notes for leaders; interactive activities; questions for discussion; multimedia ideas e.g. film and music; and resources for worship. 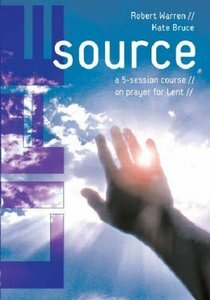 About "Life Source: A Five-Session Course on Prayer For Lent"
At times prayer can seem like hard work or a bit of a mystery. At other times it's an encounter with the Living God. Wherever you are on the journey of faith, Life Source will encourage a discovery of new-found joy and delight in prayer - for novices and old-hands alike. The course combines Bible study and discussion with a creative, hands-on exploration of five prayer patterns drawn from the richness of Christian heritage. In five interactive sessions, this course aims to help groups explore: Source of life - prayer as relationship; Source of joy - prayer as enjoying God; Source of light - prayer as listening; Source of wholeness - prayer as honesty; and Source of love - prayer as care. Each session contains enough material for a 90-minute session and includes: guidelines for group study, full background notes for leaders; interactive activities; questions for discussion; multimedia ideas e.g. film and music; and resources for worship.